We know that first time user experiences are the most important part of the user journey by 2.6x. So welcoming users in a hyper-effective way can have a big impact on your product’s activation rate. 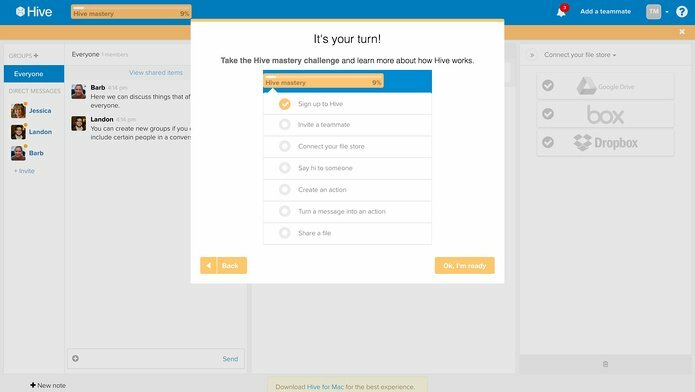 The more momentum you can build at the earliest moment through user onboarding best practices, the more likely they are to make it to their Aha! Moment and get activated. At Appcues, we’ve taken it upon ourselves to analyze every user onboarding experience we come across. Over the last few years, we’ve analyzed over 500 of these. We’ve categorized them into 9 user onboarding UX patterns, and it was only time before we put together some definitive user onboarding best practices for an effective product welcome page. Want a shortcut? Download the welcome message template! The best welcome page designs tease a product’s UI without showing the full monte. 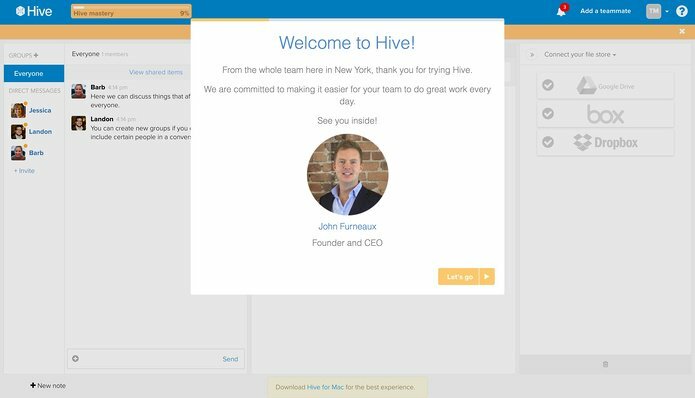 With the right design, a welcome page directs a user’s focus to the welcome message, while simultaneously orienting them to the product. 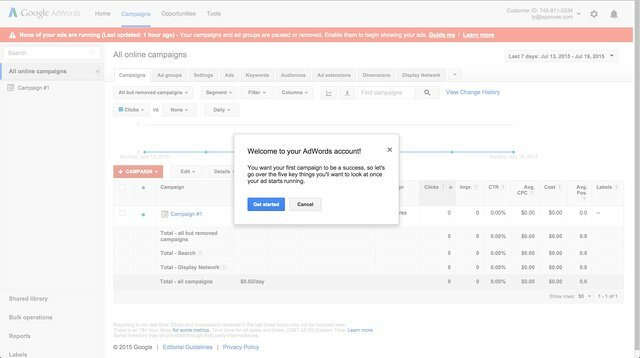 Google AdWords uses a modal window with a transparent overlay to welcome users. This strategic design causes a user’s conscious mind to focus on the more easily legible welcome message, while their subconscious orients itself to the application in background. Welcome modals designed like this reduce the anxiety of new users—they automatically know where to focus first, and they have a pretty good idea of what they’ll explore next. Sometimes users will need more guidance to get oriented to your product. If there’s more welcoming to do than a single modal allows, putting modals in a series is an easy way to expand your welcome page during user onboarding. This style of welcome messages is almost like telling a multimedia story that capture attention and draw in users. 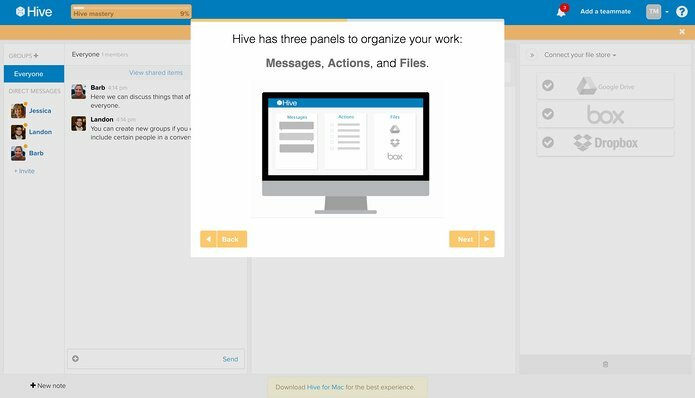 The best modal series follow an arc similar to Hive’s: welcoming, instructing, and finally, motivating users to do it on their own. The slow reveal is intriguing and can be effective in building up motivation. But the flipside is that multi-step modals can feel drawn out if the content isn’t 100% relevant—so make sure to limit the extent of their scope. 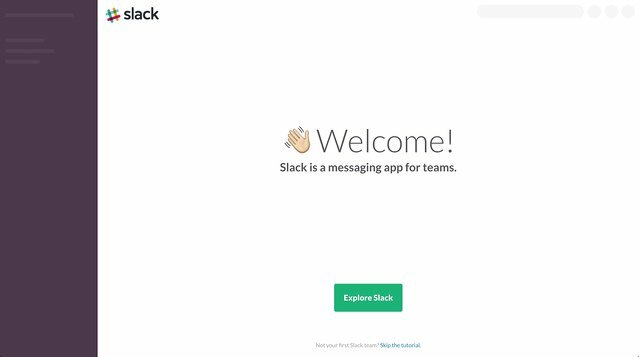 If your UI doesn’t change often, creating a custom illustration like Slack’s to complement your product’s background might help to further focus new users’ attention on your welcome message. It’s an effective way to calmly ease a user into their product experience. 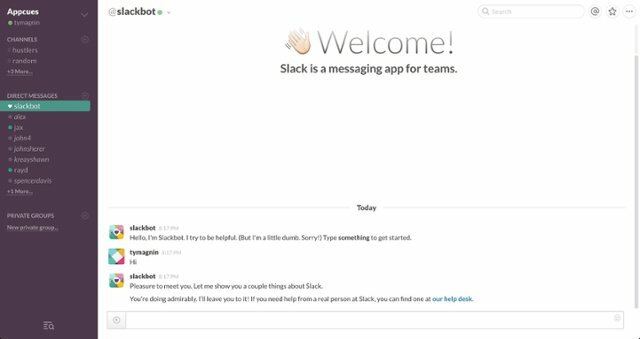 Read more about Slack’s user onboarding here. Write your welcome page copy to streamline towards aha! Generally, people don’t like to read things! Evidently you are an exception ;) So remember the trite advice while crafting your welcome message, less is more. And use the word “Welcome.” Together these words are the equivalent of shaking each new user’s hand and looking them in the eyes. It starts your relationship off right, and will loan you some integrity from users that might be the difference between churn and retain if things go a bit awry. 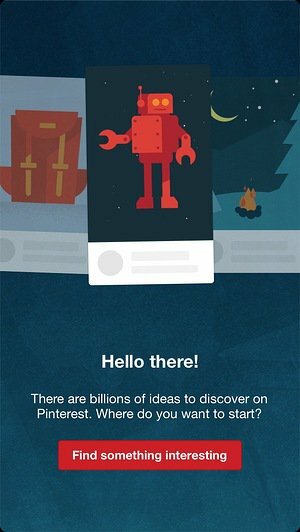 Pinterest welcomes users by reiterating the product’s powerful value prop. This method of motivation helps excite new users to get started with your product. A user’s motivation is so often critical to their ultimate success with your product. The more motivated they are, the more patient and persistent they will be in getting started and therefore sticking with your product. When you restate your value prop on your welcome page, make sure not to oversell them. That’s what marketing did for you already. A simple restatement 5-10 words is ideal. Did you read the subtext in the above modal? It’s captivating! Ptengine gets new users acquainted with their software by leaning on storylines and our cognitive bias towards completing a task. While this exact scenario might not work for your product, the concept is right. Your welcome page should set your users on a mission. One that doesn’t weigh on them as a task, but one that sounds fun and achievable within a short period of time. Check out the button text on the Pinterest’s and Sniply’s welcome page examples. Consider now for a moment, how specific and unique their button text CTAs are to these products and their user onboarding experiences. Compare this kind of copy to generic button text like “Continue” or “Get Started.” Which one are you more excited to click? 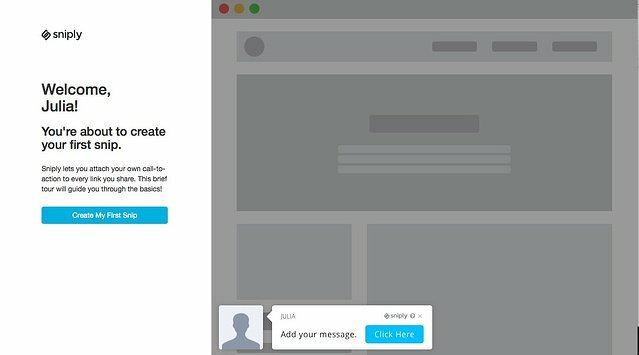 Remember, button CTAs aren’t just passive copy; they’re actions that new users are actively opting into doing. Your button text needs to set expectation for what is to come, and what is to come should be well in line with helping your user find their Aha! Moment. You’ve welcomed your new users to your product with an awesome welcome page that implements user onboarding best practices throughout. But don’t stop there. Instead of dropping them onto your dashboard from your welcome page’s button, help them towards Aha! by redirecting them to the page from which they can achieve Aha! We made this mistake at Appcues. 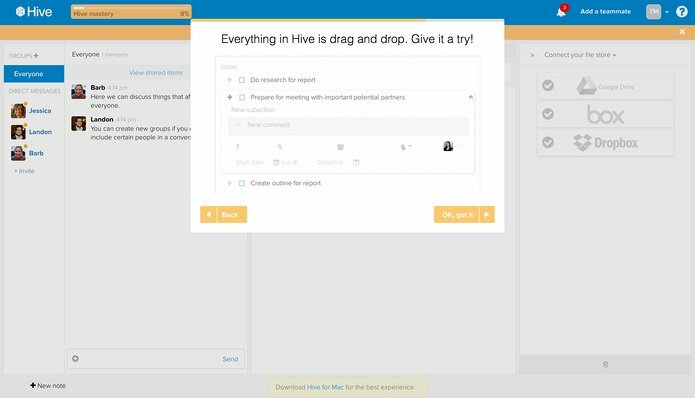 We were dropping new users on our dashboard after welcoming them to our product and asking them to then navigate to the ‘create page’ where they could pick a user onboarding pattern to create—the creation of which is our Aha! Moment. To shorten the time to Aha! we added a redirect from our welcome page to this step and improved our activation rate by 2.5x. Pretty crazy, right? !